"I'm nothing in the family in terms of running. I need to go home and start training harder. I think when I came to America, I became soft. I need a wakeup call." 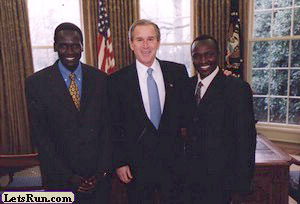 - 28:28 10ker and 3-time All-American Shadrack Kiptoo Biwott of the Univ. of Oregon speaking in an exclusive LetsRun.com piece where he talks about his brother - the new star of distance running, the new Kenyan NR holder, Mr. 2:04:27 - Duncan Kibet. Tanzanian Coach Says Athletes Were Ill-Prepared For XC Worlds Hey, the Kenyans won and their coach said they were ill-prepared as well. Don't be so down on yourselves! 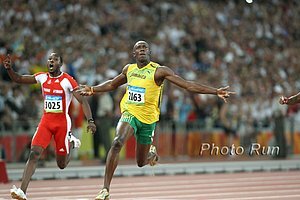 Zimbabwe Ups "Tax" On Athletes, Now Taking 15% Of Earnings For "Junior Development" Any athlete training and racing in South Africa has to give 15% of their winnings to Zimbabwe Athletics. Bauhs On First LRC "Quote Of the Day" And Carlsbad "Annihilation"
This race had it all - fast times, a thrilling finish ... and US television coverage! James Kwambai (who had battled Gebrselassie deep into his 2:03:59 world record run last year in Berlin) and Duncan Kibet (a 2:07 marathoner who came to life yesterday on LetsRun.com thanks to a video from his agent from the Netherlands' version of LetsRun, which you can see on the right hand column on this home page) battled step-for-step at a blistering pace, dropping half marathon star Patrick Makau in his debut. Kwambai pulled ahead the final 500m and appeared to have it won, but then Kibet put on a furious charge to pass Kwambai in the final 10 meters to get in the win in a stunning 2:04:27. Yes, 2:04:27 for both men. 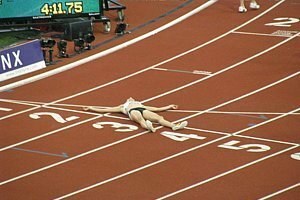 This letsrun.com message boarder was right when he posted yesterday, "Expect a couple 204s in rotterdam tomorrow, maybe even wr!" and saying, "All these guys running under an hour in the half are going to make 206 look as commonplace as under an hour has become. The marathon is finally starting to get as fast as it should be based on the the 5k and 10k in recent years by the africans." *Texas Produces A High School Prodigy, Craig Lutz The sophomore ran 9:03 for the 3,200m win and ran 30:46 for 10k on the roads last week. Good: Former East Germany Coaches Admit To Doping Athletes *Not Good: German Athletics Federation Currently Employs The Doping Coaches! Lance Armstrong Issues Statement Denying He Tried To Avoid Doping Test Whether clean or not, the fact that they've never caught Lance drives the French crazy (especially when 20% of their athletes tested positive just a few months ago). Surprise! Germany's Sabrina Mockenhaupt Won The Berlin Half Marathon Might be the only [major] race all weekend won by a non-Kenyan or Ethiopian. 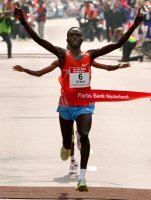 Now The 4th-Fastest Marathoner Ever (behind Kibet And Kwambai), Tergat's Next Task Will Be Berlin 25k In May *Fagan Said He Felt Flat And Terrible Despite Almost Taking Down Great Ireland Run Paul Tergat was only 1 second ahead of Martin Fagan in Ireland. Tergat is really pumped, Fagan in the dumps. Ho Hum: Paris Vincent Kipruto Wins Paris Marathon In 2:05:47 As 6 Go Under 2:07 (A Record) And 11 Under 2:09 (A Record) This may be known as the weekend marathoning changed forever. You run a 2:08 and you finish outside of the top 10 in a "B" level marathon. Kipruto is just 21 23 years old. Message Board Thread: 21 23-year-old Kenyan runs 2:05 at Paris Tim Hutchings, the commentator for the race, emailed us to say that Kipruto told him in perfect English he is 23, despite what the IAAF recap says. 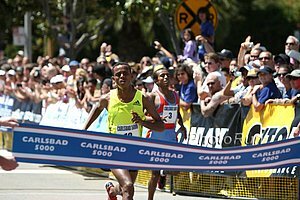 Recap: Ethiopian 2007 World Champs member Aheza Kiros held off American Shannon Rowbury for the win on the women's side. On the men's side, Daba Bekana edged Ethiopian compatriot Abreham Cherkos. Cherkos had run a blazing fast 13:07 indoors in Prague in February. Anthony Famiglietti led the US charge in 6th place as Marc Davis' American record of 13:24 from 1996 still stands. Rui Silva Over Tergat Over 10k The veteran Tergat was pleased with his 28:46 clocking, only 1 second behind Silva, just one month after his Lake Biwa win. Ireland's Martin Fagan was 3rd 1 second back and Portugal's Ana Dulce-Felix won the women's side.